"Do you realize that Jesus is there in the tabernacle expressly for you - for you alone? He burns with the desire to come into your heart..."
Adoration is the worship of Jesus truly and substantially present in the Eucharist. A Host which has already been consecrated during Mass is brought from the tabernacle and exposed in a monstrance (the vessel we use to hold the Host) for us to adore. "That voice at the window brings to my own mind a fancy which I have often had, which I suppose many of us have had before now, in looking at the sacred Host enthroned in the monstrance. The fancy, I mean, that the glittering disc of whiteness which we see occupying that round opening is not reflecting the light of the candles in front of it, but is penetrated with a light of its own, a light not of this world, shining through it from behind, as if through a window, outdazzling gold and candle-flame with a more intense radiance." This is what we experience at Adoration; we peer through the 'window in the wall', and we hear the voice of Jesus calling to us in our hearts. "If Jesus were actually visible in church, everyone would run to welcome him, but he remains hidden in the Sacred Host under the appearance of bread, because he is calling us to faith, that we many come to him in humility. The Blessed Sacrament is the ‘Living Heart’ of each of our churches and it is our very sweet duty to honour and adore the Blessed Host, which our eyes see, the Incarnate Word, whom they cannot see." "What I really prefer is adoration in the evening, even when I get distracted and think of other things, or even fall asleep praying. In the evening then, between seven and eight o’clock, I stay in front of the Blessed Sacrament for an hour in adoration." A Holy Hour recalls how Jesus in the Gospel asked the disciples to wait one hour in prayer. A Holy Hour is available in the Chaplaincy every Thursday at 6:30pm. Whilst Adoration is particularly special when the Blessed Sacrament is exposed in the monstrance, you can also visit Jesus in the Eucharist at any time wherever the Blessed Sacrament is reserved in the tabernacle. The Chaplaincy Chapel is open every weekday from 9am until 5pm; please do come in and spend some time with Jesus truly present in the tabernacle; even if it's only for a few minutes. 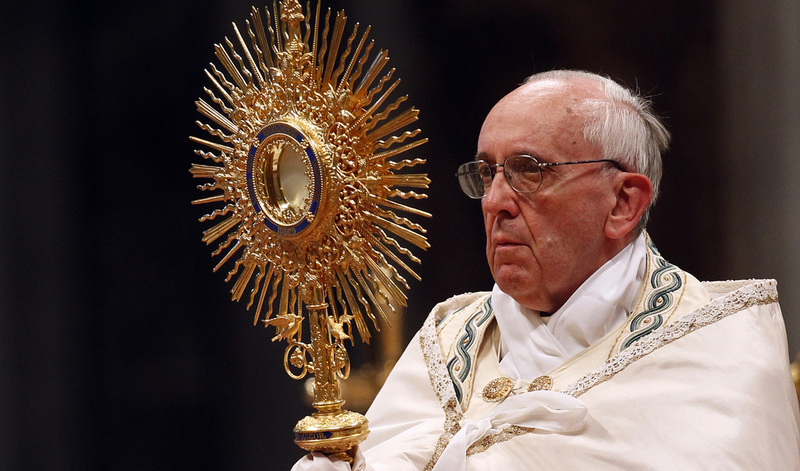 The Host will be exposed in the monstrance on the altar at the start of the Adoration. Most people in the congregation will kneel at this point in recognition that Jesus is present to us in a particularly special way. The priest (or extraordinary minister) will kneel in front of Jesus exposed on the altar and will usually say an opening prayer. He will then sit with the congregation for the period of Adoration. There now follows between 30 minutes and an hour of silent Adoration. Some in the congregation will continue to kneel in prayer for a few minutes, others will sit at this point. Whichever you feel comfortable with is ok.
Pray quietly in your own words, to Jesus who is present with you. Listen and wait for the Lord to speak to you in whichever way he chooses. Pray the Rosary, or Divine Mercy Chaplet, or other similar devotion. Lectio Divina - or prayerful reading of the Bible. Read a spiritual book (for example, a life of a saint), asking Jesus to read it with you and explain it to you. It can also be a good idea to bring a specific intention in your heart and to dedicate your time of Adoration for that request. At the end of the period of Adoration, the priest (or extraordinary minister) will kneel in front of the altar again (the congregation also kneels at this point) and say a concluding prayer. On a Thursday, this is usually a prayer for priestly vocations, which you will find on the card at the end of the pews. The priest will then put on the humeral veil (a wide piece of cloth that goes over the shoulders and covers the hands) and go behind the altar for Benediction. Benediction is a very special moment, in which Jesus blesses us. The priest raises the monstrance, with the Host enthroned within, and makes the sign of the cross over the congregation. The priest will then repose the Host, by removing it from the monstrance and replacing it in the tabernacle (if no Priest is present, there is no Benediction and the reposing of the Host occurs straight after the concluding prayer).